EAS tags are tied to a dedicated technology surveillance and traceability technology. The main systems available on the market are the Sensormatic Acusto-Magnetic EAS system and the Checkpoint RF system. They differ in technology and frequencies but have very similar end-use functionalities. 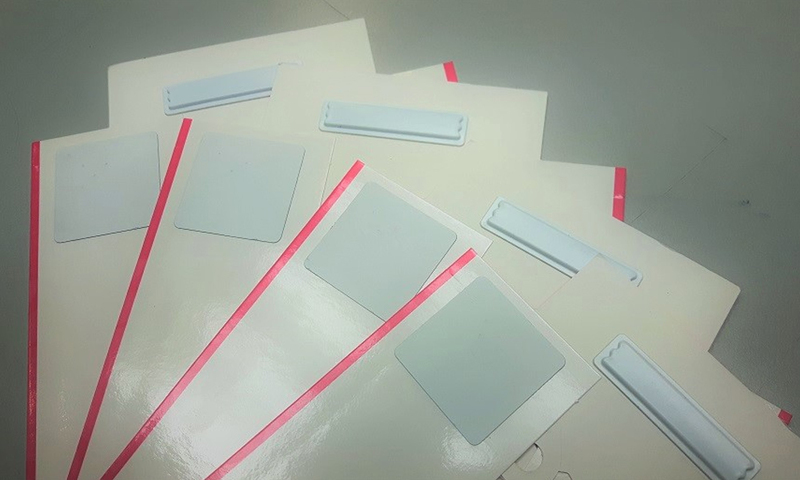 For a better and faster in-store processing during the reading and deactivation process, it is recommended that the tags are glued to the packaging although some choose to simply drop them into the packaging. Netpak carries both technologies and the tags are applied inline on our folder gluers for an optimal efficiency. We are working in close partnership with major actors on the market to provide our clients with the most reliable solutions, the latest technologies and the most efficient application machinery to maintain a high speed folding / gluing process performance. Depending on the needs of our clients, Netpak is able to apply inline one or both tags together on each folding carton. Having both tags on the packaging allows product manufacturers to carry one inventory compatible with both systems without worrying about the technological choices made by the retailers. Applying the EAS tags inline at the folding carton manufacturing stage is the most efficient way to proceed, since all operations take place under the same roof, on the same production line. Since all operations are tied together, all aspects of the packaging are thought together upstream, from need assessment, graphic and structural design, choice of the board to tag selection and positioning to provide our customers with a one stop integrated packaging solution tailored to their needs. Depending on the product, the market and the distribution network you use, Netpak offers a wide variety of source tagging solutions and we will be happy to share our knowledge and experience. Do not hesitate to contact us (netpak@netpak.com) in order to discuss potential collaboration opportunities, and solutions that we can bring to you.